One of the most clamored-after features that has recently been made available for iPhone, iPod touch, and iPad devices is the ability to change homescreen wallpapers and backgrounds. No more boring standard black! With this ability comes an infinite number of possibilities for expressing yourself. One great tool to help you is Diatom Studio’s interactive drawing app, Flowpaper. Why settle for stock images when you can easily create something unique with Flowpaper? 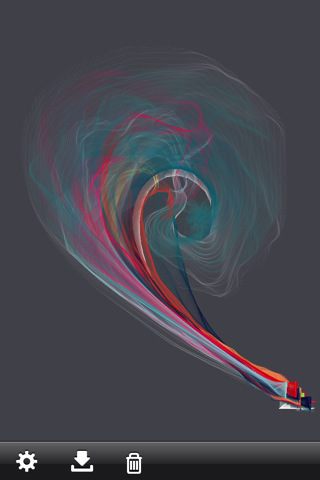 Flowpaper uses brushes, physics, and your finger as mediums to create fascinating waves and curves across the screen. Tap the gear icon at the bottom toolbar to choose what goes onto your canvas: a brush color; the length, flow (curvy as opposed to rigid), and opacity of the brush; and the background color. Make sure to scroll through the brushes and backgrounds list by swiping left and right, so as to view all the possibilities. Once you’re done arming yourself, tap out of the menu (hit the X in the corner) and channel your inner Picasso. Swipe anywhere on the canvas and watch curves and grids bloom. The second icon on the toolbar allows you to send whatever is on the canvas by email, or to save it to your Camera Roll to be used later. The next button is the Undo button, but you can only undo the last stroke, so be aware of your motions. And if you do not like what you see, you can always trash your work and start anew using the Trash icon. This art app can be in either portrait or landscape orientation; the toolbar will adjust accordingly. Flowpaper is an amazing physics-based art app that is capable of creating gorgeous works of art. It is also very much in the early stages of development, especially in terms of features. The latest version of this app (1.1 at the time of this writing) remains extremely simple, which is great for people who are testing the $0.99 waters, but can also be a tad frustrating for users who like more control and customizations. For instance, the restriction of only one Undo action allowed is interesting for creativity, but a little impractical; I’d love to have a Redo and Eraser functions, as well. Flowpaper is perfect for lovers of the abstract and people who are bursting with individuality, but even if these don’t describe you, it’s hard not to be an artist of fine works with this app. Of course, future updates would be expected to offer even more varieties of brushes and backgrounds, or maybe even the ability to choose our own colors from a color wheel. The possibilities are endless, both with the tools given and what can come out of them. 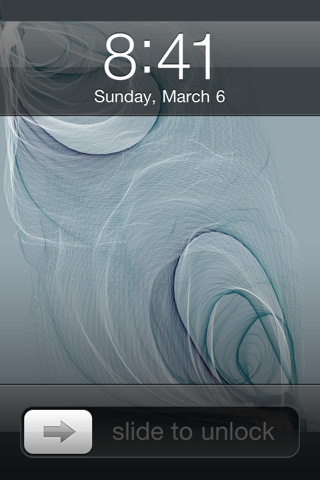 AppSafari review of Flowpaper was written by Julie Guan on April 6th, 2011 and categorized under App Store, Art. Page viewed 5594 times, 2 so far today. Need help on using these apps? Please read the Help Page. I do like this app and the possibilities are endless with the application of other apps also to edit work. However, I do have a problem when uploading a picture from my camera roll to use as background it will not let me as it states the picture size is too large. Anyone have any ideas how to reduce the size of my photo’s so that it will be acknowledged by flow paper? I cannot get Flow paper to work. It either crashes right after I open it or it takes an eternity to upload an image. I haven’t been able to use it.